An Advent calendar is a special calendar used to count the days in anticipation of Christmas. We're celebrating the Advent with a collection of Christmas quilts we've admired. Without further ado... let's begin with Day 1! The Twelve Days of Christmas (a popular Christmas carol) are depicted here in Scherenschnitte rows made in red felt on white. For the melody and lyrics to this song, please click here. The tree is topped by a partridge in a pear tree as shown below. 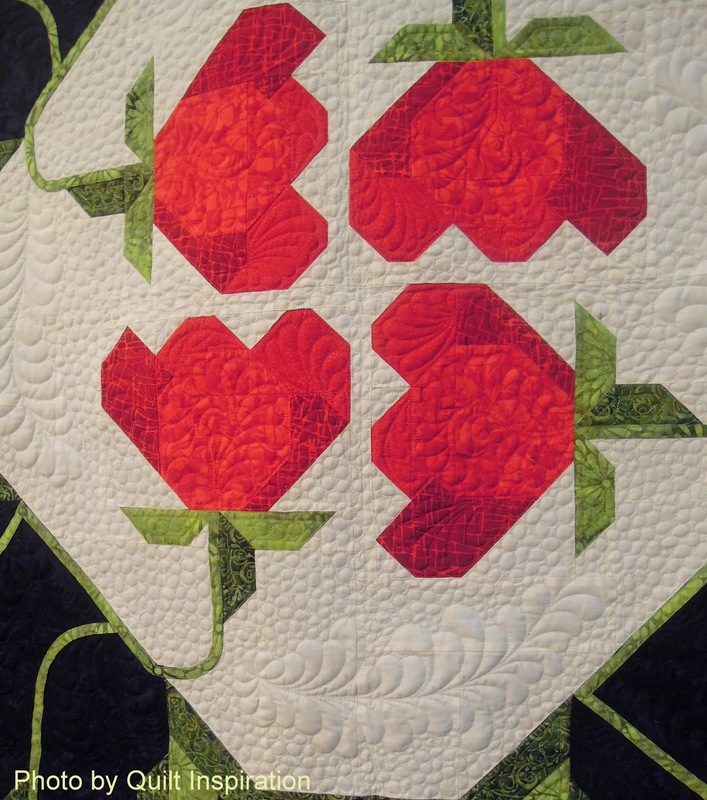 In describing her quilt, Ruth writes, "A life long enchantment with paper cuts and felt has brought me to this project. I found a pattern twenty odd years ago in The Family Circle Christmas Treasury 1989 for 'The Twelve Days of Christmas in Paper Cuts'. When I retired, I wanted to see if I could translate them by cutting felt fabric instead of paper." In this close up photo you can also see the five rings, four calling birds, three French hens, and two turtle doves. This scalloped border is embellished with stacked circles of felt; each raw edge is beautifully blanket stitched with white thread. Last but not least, can you see the clever way in which Ruth created a fanciful papercut of her name (Ruth Hoglund)? She concludes, "The creative force took over, and I knew that I had to design many new patterns that better fit my vision. The quilt that hangs before you is....A little of them and a whole lot of me." Image credits: Photos were taken by Quilt Inspiration at the 2013 Diablo Valley Quilters' Guild Show. Thanksgiving Day in the United States is a holiday created especially for the purpose of expressing gratitude. We at Quilt Inspiration want to say a giant "Thank You" to all our wonderful viewers and readers who have been so supportive and kind for almost four years now. We're especially grateful for over 1700 followers, over 3,000,000 page views, and over 50,000 members on our Pinterest website. We greatly appreciate and value your participation. Above, we're showing a patchwork Thanksgiving quilt that is completely pieced. 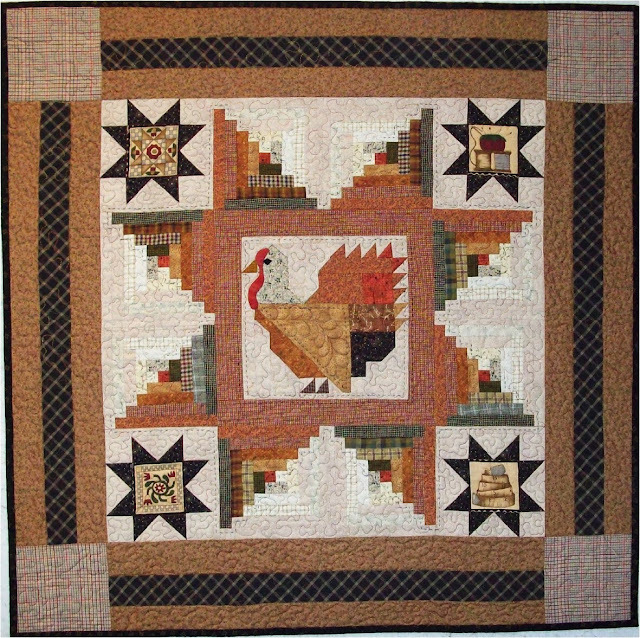 Sewn in traditional autumn colors, this quilt features a large turkey in the center, with tail feathers in half-square triangles. Visual interest is enhanced by a log cabin inner border arranged in triangles to create a large star, with smaller Amish stars in each corner. Actually, this pattern could be modified for many different holidays, simply by replacing the figure in the center medallion and changing the colors. For Easter, try a bunny in the center, with lavender and periwinkle log cabin blocks. Or, how about a cheerful Santa for Christmas, with pine green log cabin blocks and bright red Amish stars in the four corners? The possibilities are endless, as are our thanks to you, dear readers! A very Happy Thanksgiving to all of you. Image and design credits: Sew Many Visions is a quilt pattern company owned by Vicki Arnold and Pat Gates. For more information see the Sew Many Visions website. We're continuing with our coverage of loveable canine and feline images displayed at the International Quilt Festival in Houston, Texas. We think these are all wonderful! In the Comments section below, you be the judge and tell us which ones are your favorites. Do they remind you of your own precious companions? Ruth states, "These are my two dogs, a 165 rescued shepherd mix and a 145 pound Komondor. I took the photo several years ago, intending to make it into a quilt. This exhibit spurred me to get it done." Komondors are a rare breed with long cords of white fur, resembling a large rag mop. You can see the photo that inspired the quilt at Ruth Powers' blog. For Ruth's original design, she used machine piecing and free-motion quilting on a domestic sewing machine. In this close-up photo you can see the pieced segments that make up the dogs and the snowy background. We really admire the contemporary geometric piecing of the Komondor's coat which gives a lovely three-dimensional collage-like effect to this quilt. Franki says, "Mendelssohn, my bichon frise buddy, was just eight weeks old when my sister snapped a photo of him playing in the grass. I knew immediately that I would use the image to create a quilt." Franki began drawing the pattern in a class taught by Ruth B. McDowell. "Mendelssohn" is machine pieced, then free-motion quilted. The languid curves of the quilt pattern here are very reflective of the wavy fur coat possessed by many bichon frise dogs. If you’d like to learn more about the inspiration for and construction of this art quilt, and see the original photo that inspired the quilt, click here. Barbara writes, "Drew, our Dalmatian mix, was adopted from the local animal shelter in 2002. He has become my best friend, loyal companion, and the muse for my art. This quilt is the 10th in a series of portraits featuring my best friend." We love Drew's smiling face and laughing eyes. Doesn't he look as if he's ready to play? 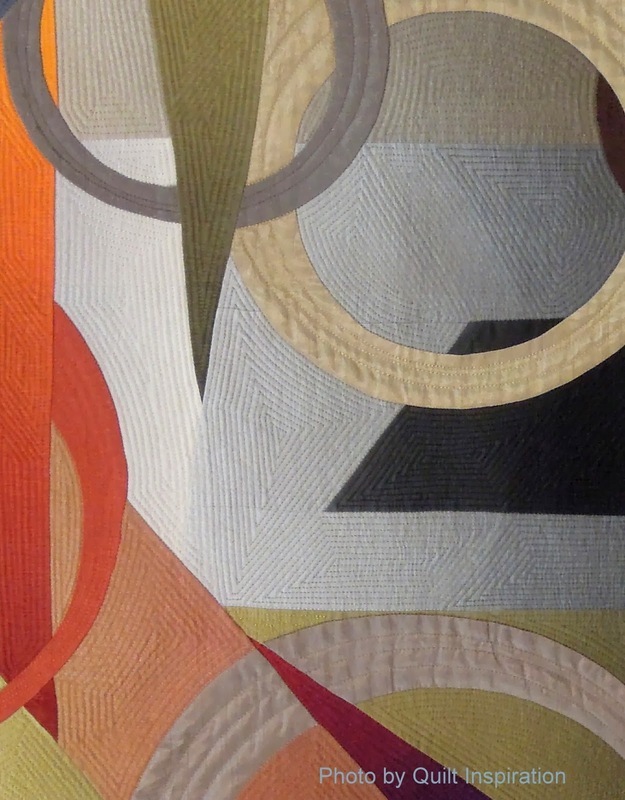 To assemble her quilt, Barbara used raw-edge fused applique, then she free-motion quilted it. She has made very effective use of many different values of black and white fabrics. Pamela notes, "About a year ago, a stray cat came crying to our house. He was cold, full of fleas, and un-fixed. We took him in and gave him a home. A week later, my mother passed away. I think that my father sent him to us to help me with my grief." Surrounded by an elegant, classic border that looks almost like an oil painting, this cat has a very noble, dignified look. To create her original design, Pamela used over 50 colors of rayon thread. She drew the outline of the cat on muslin; then did thread painting, hand applique, and machine quilting. Suzan notes, "This is Roxy and Lucy Furr. They are Italian mastiffs and belong to my little brother, who loves big dogs.....When I saw Lucy's eyes, I was inspired to try to document her piercing stare into a quilt." The 2013 Houston IQF had a special, juried exhibit called "It's Raining Cats and Dogs". This exhibit was among the most popular of the entire show. In addition, there were some fantastic miniature cat quilts, such as "Princess Daphne", shown below. These skilled artists used either photo transfers, applique, or fabric paints, combined with masterful thread painting. We are in awe of their talent! Karen Ponischil is a graphic designer by day and an art quilter by night. She lives in North Carolina with her husband and four (yes, four) kitty cats. Karen says: "My husband has encouraged me to do projects other than flowers. We had along discussion about this one evening in my studio. I thought, “what else could I do?” I looked over to see this face looking at me from the top of my fabric shelf… perfect!" "Princess Daphne" was whole cloth painted, thread painted, and the blue area was hand appliqued and free motion quilted. This piece, which is only 14" high and 23"wide, won honorable mention in the Art-Miniature category at the 2013 Houston IQF. Mary Ann has a BFA in studio art/ceramics and MA in drawing and printmaking; she has worked in many different artistic media, often incorporating textiles. Starting in 2006, she has focused on studio quilts and has started exhibiting her work. This piece, "Georgia", was juried into "It's Raining Cats and Dogs". The cat was drawn and painted, and the texture was enhanced with thread painting. As shown in the close up photo below, Mary Ann created a third dimension with whiskers that protrude from the quilt! Mary Ann says: "Georgia is the head of the household, so she thinks. She is a very strong-willed 'senior kitizen'. She had been abandoned as a one-year-old before she came to live with us in 1998. she has become my husband’s shadow and sticks to him like Velcro." Jeannie Moore is a lifelong artist/watercolorist, graphic designer and professional art director; she is the author of the Mixed Media Quilt Art DVD. She says that "Tiger" was inspired by a photo of her cat, Tiger, who was basking in the sun: "I’ve always loved having my Tiger alongside of me while I work in my studio. This is a tribute to her for 16 years of unconditional love, purrs and cuddles... I thought it would be fun to do a subtle background combining modern quilting with my newspaper transfer". We were intrigued by the artistic effects in this piece, which make it appear as if Tiger is sitting on an actual quilt. The cat appears to be subtly drawn on the quilt in a watercolor style, while the thread painting adds the texture of real fur. Jeannie explains: "Recently my quilts are taking on a more painterly style with the use of Tsukineko inks. I also enjoy combining the inks with my mixed media techniques. With the addition of stitching on the painted fabric, the animals come alive." Virginia Greaves is an award-winning art quilter who focuses on portraits. "Firecracker" was shown as part of the "It's Raining Cats and Dogs" special exhibit at the Houston show. Virginia explains the inspiration for this piece: "My mom was grieving the sudden loss of her Maltese recently and was given a Yorkie to love… when a visitor comes, she gets so excited, she acts like she is going to explode, just like a firecracker." The close-up photo shows the hundreds of miniscule strips of fabric, in many different values of brown and beige, which were appliqued to create the dog. On Virginia Greaves' blog, she explains: "In case anyone wants to know — yes it really is an applique piece. This is NOT a photograph — this is NOT an inkjet printed piece. It was insanely difficult but I feel like I’ve solved a difficult puzzle." Barbara McKie has had many careers (see her bio here); in addition to being a professional quilt artist, she has consulted in the computer field. Barbara carries her interest in computer graphics into her art quilts, which often feature her photographic images. She says, "I urged my cousin’s cat, Taz, to come to the kitchen sink to drink, and she obliged as I captured her in this funny pose." We are amazed by the results, which combine the realism of photography with a quilted surface. It is the uncanny look of the cat's eyes, which appear to be staring right out from the surface of the quilt. Also check out the silvery stream of water as it hits the cat's pink tongue. Barbara added to the realism by using trapunto on the cat's features. The face is heavily thread painted with tiny stitches. Image credits: Photos were taken by Quilt Inspiration at the 2013 Houston IQF. The special exhibit included fabric animal postcards, donated by hundreds of quilters, which were sold to benefit Houston's no-kill animal shelter, Friends for Life. To read more see the article at the Houston Chronicle. and the original call for postcards at Pokey's Ponderings. 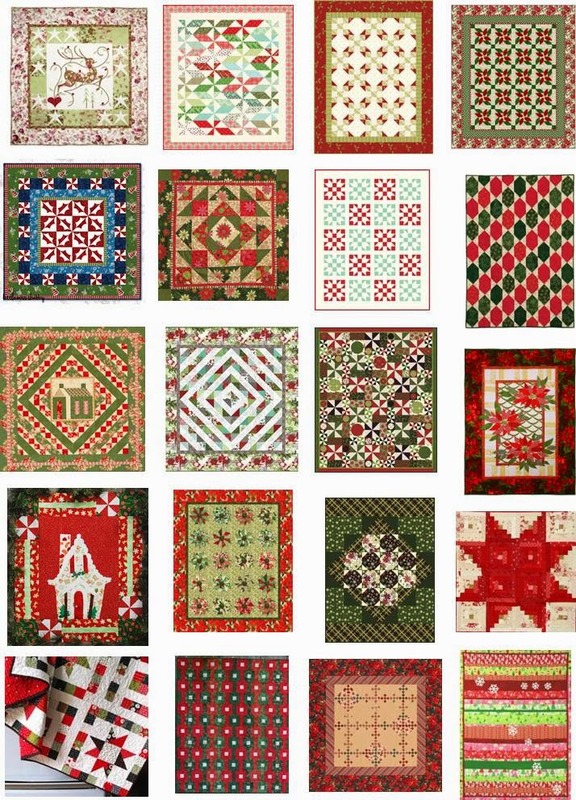 Here are MORE free patterns for festive holiday quilts. We've included plenty of pretty pieced patterns which can be made in a hurry... just in time for the holidays! Note: this post was updated in 2015. For the current post, see Free pattern day: Christmas 2015 (part 3). We had a wonderful time meeting very talented, multi award-winning, and vivacious quilt artist Pauline Salzman at the Houston International Quilt Festival. From Treasure Island, Florida, Pauline creates outstanding, whimsical art quilts honoring man's best friend, the canine. Here is Pauline with "Mt. Ruffmore", a quilt based on the American monument, Mount Rushmore in South Dakota, where the heads of American Presidents are carved out of a mountain. Pauline has ingeniously designed a quilt where the dogs owned by several Presidents appear in a venue which looks very similar to the mountain itself. Pauline notes, "These are the Presidents' dogs: Bo (a Portuguese Water dog owned by Barack and Michelle Obama), Buddy (a chocolate Labrador retriever owned by Bill and Hillary Clinton), Barney (a Scottish terrier owned by George W. and Laura Bush), and Heidi (a Weimaraner owned by Dwight and Mamie Eisenhower)." For this well-known and always beloved quilt, Pauline used fusible applique and fabric pens to help with the shading. She also used machine quilting on cotton fabrics with Hobbs wool batting. We love the way that the dogs portray a sense of gravitas and dignity, just like their owners. Pauline notes, of her original design inspired by her pets, " [My dogs] Ally and Lucy are impossible to crate. The howling and barking that ensues is unbearable. They, however, have no problem riding in a different kind of crate. All crates are not created equal." This very colorful work, complete with the complementary tropical hues of Florida in the background, is done with fused applique and blin stitching. We really enjoyed looking at all the fun details here. First, the convertible is rendered very realistically, including its BMW logo. Then, Ally and Lucy have a wonderful sense of hope and expectation on their faces, now that they're out of their dog crates. Even the embellishment on their collars is cute -- check out the little bell. To us, these happy pooches seem to know that they're headed off on a lively adventure. Doggieminiums, with its fascinating details and delightful striped border, was one of the most popular quilts in Houston. Hordes of admirers stopped by to gaze lovingly at all the darling dogs. Pauline says that the design source for this pieced and appliqued work is based on Kaffe Fassett's Cabana blocks. Pauline humorously writes, "The rules are different here. No one over 120 pounds. Howling and barking are allowed before 10 pm. No growling is ever permitted.....All doggie doors on garage dog houses must be closed at dusk for the night. [Owners] association fees are one bone per month, penalty if late. Late fees are one more bone. " This cute Dalmatian puppy wears the traditional FD (Fire Department) hat, as Dalmaltians have traditionally been associated with fire fighters and firehouses. (Isn't this some of the cutest fabric you have ever seen)? Pauline is a highly entertaining story teller; we think you'll really enjoy what she has to say in this Quilters Share Our Stories video. She shares valuable and information about her expert techniques on Home and Garden Television's "Simply Quilts" with Alex Anderson. Pauline also has been featured on Quilting Arts TV. In addition, please check out her Facebook page, Pauline Karasch Salzman. Many thanks to Pauline for taking time to share so much valuable and interesting information with us. It was a real pleasure to be able to talk with her in Houston, Texas. Image credits: Photos were taken by Quilt Inspiration at the 2013 Houston International Quilt Festival. The quilts by Pauline Salzman were exhibited in the Festival Awareness Project: It's Raining Cats and Dogs. Today is Veterans Day, a U.S. holiday that honors all military veterans. In Commonwealth countries, today is Remembrance Day. 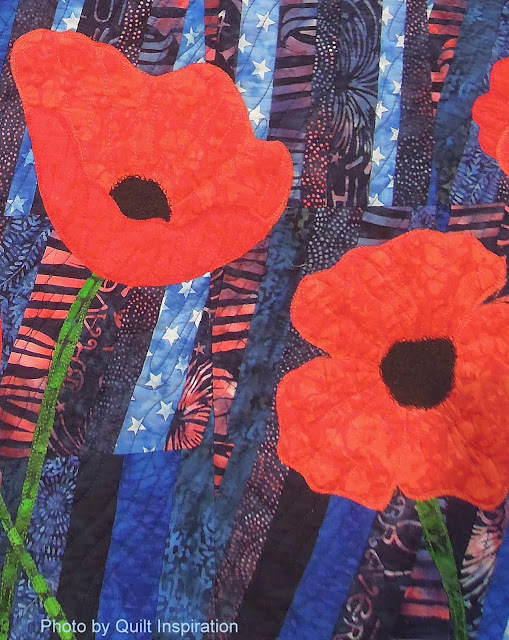 We thought that readers in many countries might like these Quilted in Honor poppy quilts. Inspired by the World War I poem, In Flanders Fields, the red remembrance poppy has become one of the world's most recognized memorial symbols of soldiers who have died in conflict. The Remember Quilt pattern was created by designers Mary Hoover and Barbara Persing at 4th & 6th Designs. This quilt also features the beautiful blue Island Batik Quilted in Honor fabrics. All proceeds from the sale of the pattern benefit Quilted In Honor, a fund raising initiative for Operation Homefront. Mary Hoover and Barbara Persing are sisters and quilters best known for their designs made with strip-pieced backgrounds, as in this beautiful "Remember" quilt. They also are authors of the highly rated book, StrataVarious Quilts ("stratas" are made by piecing together strips, which are cut into squares or triangles to create quilts). Pam Bono has been designing quilt patterns for more than 30 years. 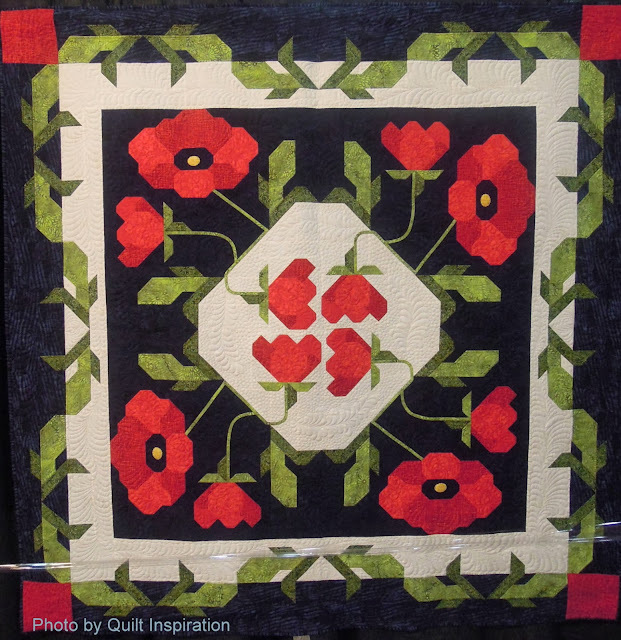 Her original Remembrance Poppy quilt pattern was officially recognized as Canada's Quilt Of Remembrance Day. 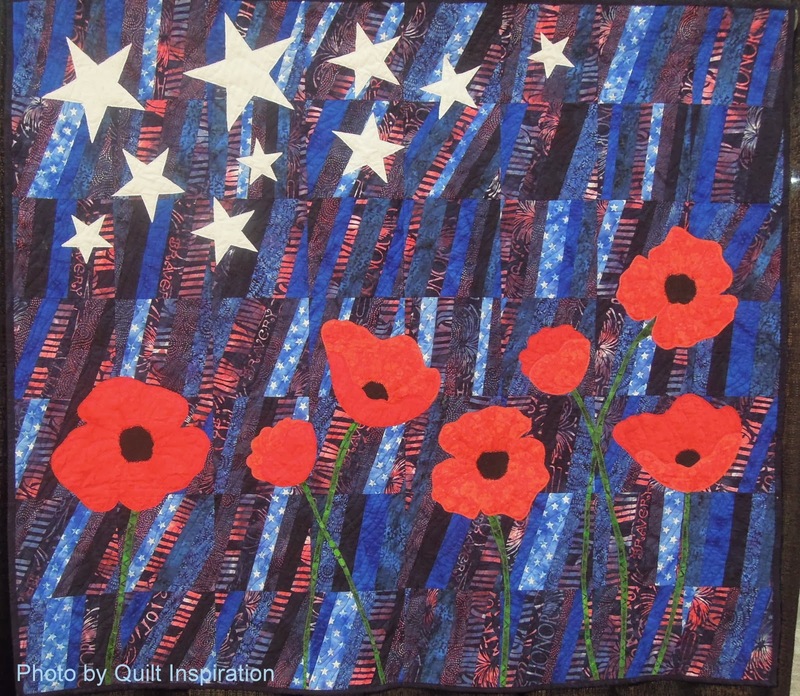 The batik "Quilt of Remembrance" shown above was designed by Pam and Robert specifically for the Quilted In Honor initiative. In this close up photo you can see the gorgeous feather quilting by Mary Nordeng, which adds extra dimension to the colorful poppies and the white areas of the quilt. The theme of this year's Open European Quilt Championships was "Berlin". One of Europe's most inspiring cities, Berlin also wears the scars of history. You may remember that the Berlin Wall separated East and West Berlin from 1961 to 1989. On November 9, 1989, the wall began to fall. Since today is November 9, 2013, we wanted to show quilts that won awards for the theme: Berlin. In the quilt, East German soldier Conrad Schumann is shown in his famous leap to freedom over a section of barbed wire (the original photo can be seen here). Additional running figures, and their footsteps, can be seen in the background on the right hand side of the quilt. Esther's solemn and stirring work is all hand pieced and machine quilted. Esther notes, "[This quilt commemorates] crossing the Berlin Wall, taking a leap to freedom. This quilt is in honor of those who had the courage to escape the East German regime in search for freedom and in memory of those who lost their lives trying to escape." Their names were printed on the left hand side of the quilt as shown above. Elly made this fascinating longarm quilted piece in remembrance of her first trip to Berlin in 1989, just before the wall came down. She has attached an actual chunk of stone of the Wall in the lower left corner of the quilt. The quilt brings to life the Berlin Wall graffiti art; see the original photo at Wikipedia. Annalies writes, "Photos taken during my stay in Berlin in October 2012 have inspired me. The architecture caught my special attention. Berlin is a never-ending story since die Wende" (the change, or turning from the Socialist Unity Party and a centrally planned economy to parliamentary democracy and a free market economy in East Germany around the years 1989-1990). "The city is constantly in evolution. I try to depict the atmosphere of a modern city where memories are kept alive." Annalies has set this intriguing spiral staircase amongst a series curved motifs done in high contrast colors, which creates a fascinating center medallion. Street names are also shown on this intricate and beautiful quilt. "Unter den Linden" (Under the Linden Trees) is a famous wide boulevard in Berlin landscaped with these lovely trees. Albertje says, ["This] fabric is dyed and stamped. Green is for the park, blue for the sky, and orange for the warmth of the people." Albertje notes, "The beads (upper left and in the center) represent the numerous people that visit Berlin." In this close-up, you can see some of the intricate coloring of the dyed and stamped fabric, which is alternately covered with netting, quilted and beaded. Marjan notes, "The bear is the symbol of Berlin. Throughout the city, you find colorful paintings and mosaics of the bear. I made my bear completely with leftovers (scraps). " In medieval times, bears roamed the woods surrounding the city, which is apparently why the people of the Berlin decided to adopt the bear motif as their mascot. Marjan's vibrant, eye-catching work is all hand-pieced and hand-quilted with big stitches. *Footnote: Conductive thread connects a tiny LED light - which comes in several colors - to a small battery. It allows users to add one or more LED lights to their fabric art or wearable clothing. For more information visit Superior Threads. More fabulous quilts from Houston ! We loved every minute of the Houston International Quilt Festival, where fabulous quilts were in abundance ! Here are some more of our favorite show-stoppers. 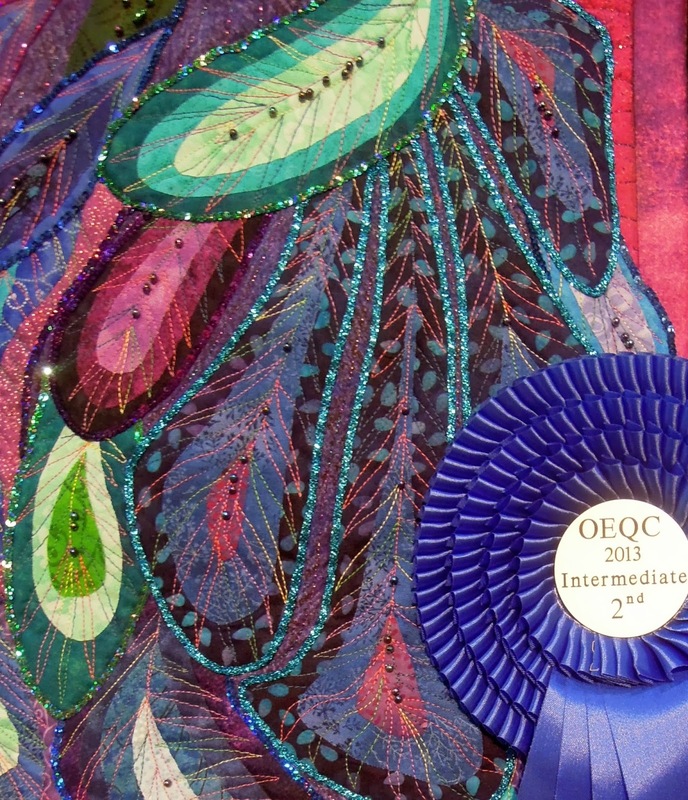 First place winner in the Innovative Pieced category, Sandra notes, "This quilt is the second in the "Bohemian" series. The original designs of "fractal wheels" in the series are hand crafted. Fabrics in multiple colors and unrelated patterns are used to carry out the Bohemian theme. The titles in the series are all inspired by summer, first fireworks, and now, Ferris wheels and kites." The lovely complementary colors give so much sparkle to the center medallion, in our opinion. Sandra's techniques include machine piecing, foundation piecing, and hand quilting with cotton thread on cotton fabrics, and Warm and Natural cotton batting. Winner of the $7,500 World of Beauty award, this original design is just one of three separate quilts which Christine created and then bound to make a quilted book. Each "page" depicts a different sin. The artist writes, "Although inspired by illuminated manuscripts, the theme tackles how little human nature has changed since these manuscripts were first created. I wanted to explore how these seven failings speak to... human nature; why we are, in all our seeming morality, still guilty of these sins." For materials, Christine used cotton, silk, synthetics, fabric paint, Pigma Micron pens, Warm and Natural batting, fusible interfacing, Misty Fuse, Superior silk and metallic threads, and cotton, polyester, and rayon threads. Christine says of her techniques, "Designs were painted on each panel and sandwiched together to make three quilts that were carefully matched and then quilted. Each was folded in half vertically and bound using traditional book-binding techniques." We really liked the elegant border and the detail of the lettering underneath the image. 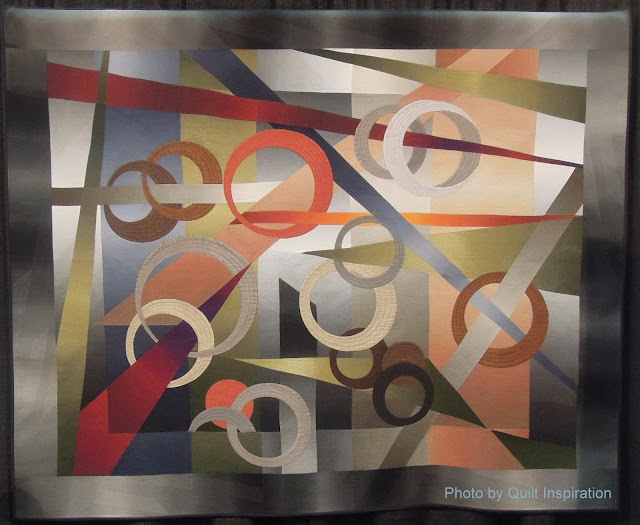 Winner of the $5,000 Pfaff Master Award for Machine Artistry, Shirley notes of her original design, "The inspiration for this quilt is mid [20th] century abstract art. It features ombre fabrics, which contribute to the shading effect, and polyester shantung for the rings to add a metallic sheen. It is done in muted tones and is entirely pieced. The quilting echoes the geometric shape of the pieces." According to the white glove volunteer on duty, the geometric quilting of the solid sections was done by stitching 1/8" apart. We loved the sense of luminosity provided by the darker and lighter values of the neutral fabric colors. Sylvia notes, "Near the center of Berlin [Germany] is the Peacock Island, with beautiful peacocks. I have made them in cross stitch and applique, in one project. The peacock made of fabric embraces the cross stitch peacock. Two colorful birds, made of thread and fabric." An award winner at the 2013 Open European Quilting Championships, Sylvia used beautiful, eye-catching shades of monochromatic blue to depict the bird's face, neck, and feathers. We enjoyed the pretty beading and threadwork on this beautiful quilt.